Jeoung Youngisk and Kristian Karlsson have both been knocked out in the opening round of the Men's Singles. Lubomir Pistej proves ranking is just a number. Lubomir Pistej (SVK) has caused the biggest upset of the Liebherr 2017 World Table Tennis Championships so far by knocking out the 11th seed, Jeoung Youngisk (KOR), in the first round of the Men’s Singles. Pistej was extremely happy with the win, but not shocked by the result. Going in to the match Pistej thought he was going to struggle with the stylistic matchup, but it wasn’t the case. Day of upsets – Jeoung Youngsik & Kristian Karlsson crashed out of #ITTFWorlds2017 in opening round! Follow more action on tv.ITTF.com! On the table next door, another upset was occurring. Cheng-Ting Liao (TPE) defeated 19th seed Kristian Karlsson (SWE) 4-1. Liao was still finding it hard to contain his excitement after the match. In the main hall, Dimitrij Ovtcharov (GER) was given a scare by Lubomir Jancarik (CZE), with the Czech taking the match to a sixth game, but with the German ultimately prevailing in front of his home crowd. 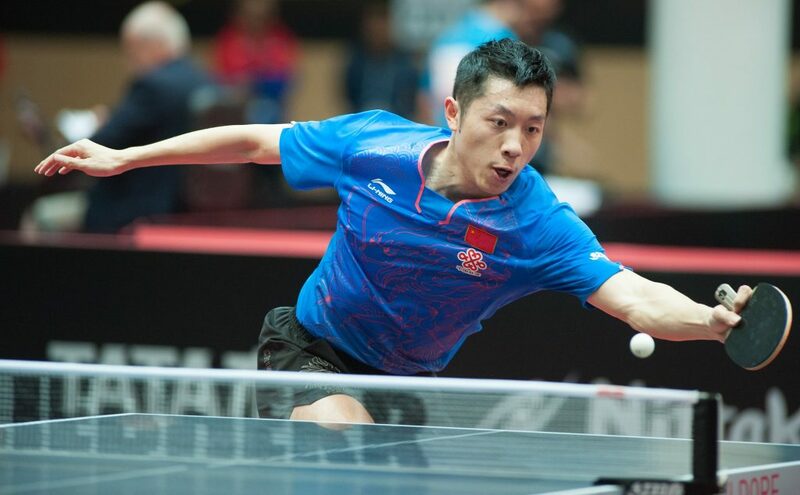 Meanwhile, Xu Xin (CHN) found himself in an even tighter situation against Tomas Polansky (CZE). Polansky took the opening game and led 5-1 in the second. Xu was able to muster a comeback and win that game 11-9. But Polansky wasn’t going anywhere, pushing the match to a sixth game. A boisterous Chinese crowd was able to see their hero over the line, but only just. Xu took the sixth game 11-9 to win the match. However, there may have been more at stake in the match than meets the eye. Liu Guoliang has stated that if Xu Xin has a poor performance at this World Championships, then he would no longer be considered one of the top four players in the Chinese national team; nervous days lay ahead for Xu Xin. Xu Xin had to stretch for the win against Tomas Polansky.